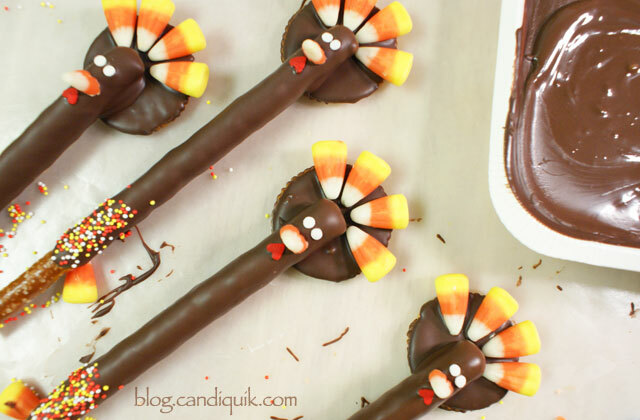 I just love these little turkey pretzels! 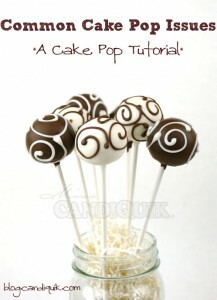 These pretty much use the same instructions as my turkey cake pops I made a couple years ago. Plus, I’m kind of on a make-a-pretzel-for-every-holiday kick, if you haven’t noticed. All you need to make these is leftover candy corn, Ritz crackers, confetti sprinkles, a handful of heart-shaped sprinkles and chocolate CandiQuik. 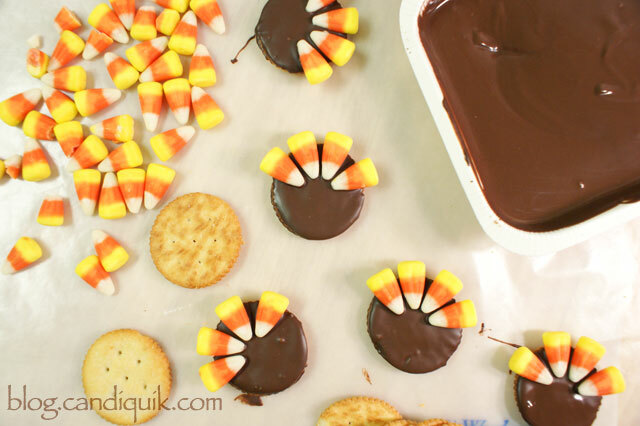 Dip the face of the Ritz in the melted chocolate CandiQuik and arrange the candy corn as shown. 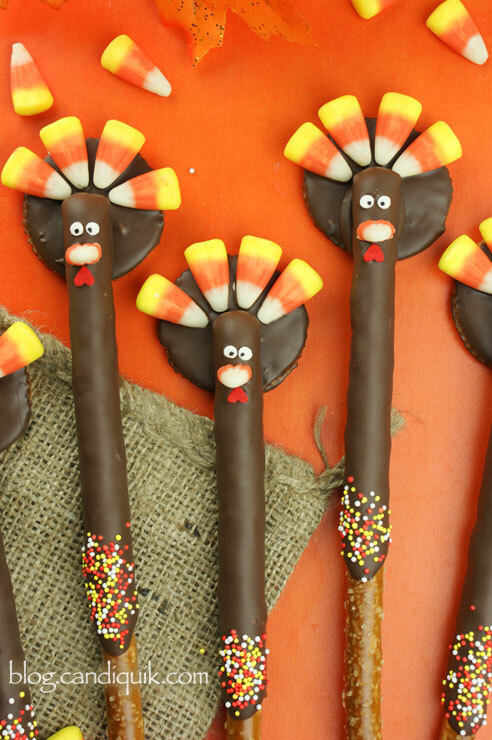 You can whip out a bunch of those and let them set before you start dipping the pretzel rods. They look creepy without their pupils! 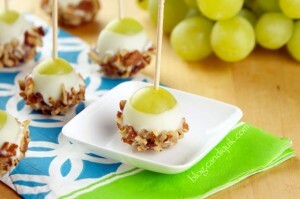 Dip the tops of the crackers in Chocolate CANDIQUIK and place on wax paper. 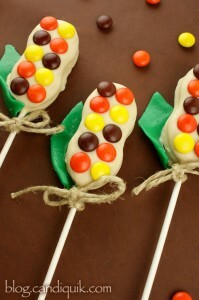 Before dry, attach 4 pieces of candy corn near the top edge of each cracker. Let set. 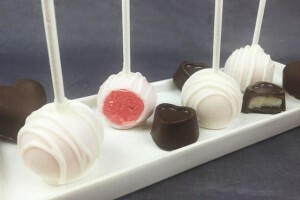 Dip ¾ of each pretzel rod in the Chocolate CANDIQUIK, allow excess coating to drip off, then press and hold the pretzel rod against the cracker until secure. 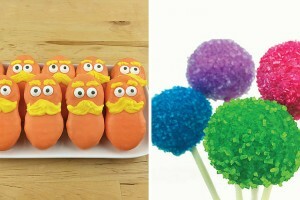 Before pretzel is completely dry, press one candy corn on the pretzel rod as the nose, holding in place until secure. Sprinkle nonpareils near the bottom of the pretzel if desired. 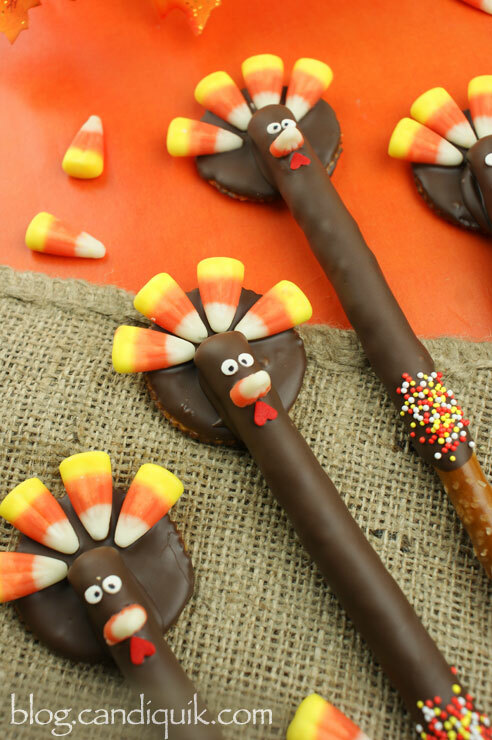 Press two white confetti sprinkles on the pretzel rod as the eyes and press a heart sprinkle (upside-down) below the candy corn nose (be careful not to touch the chocolate coating). Finally, add two black dots on the eyes with the edible marker. So dorky, yet so cute. I am just a little bit in love with these cuties!!!! Thanks, Chandra! Nice to see your name pop up – hope you have a great Thanksgiving! 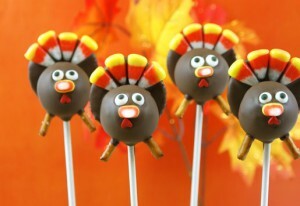 Oh my gosh, these are just about the cutest little turkeys I have ever seen!!! 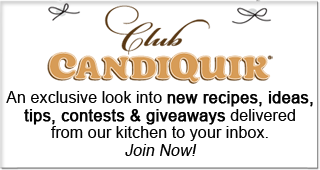 And so fun to make! Thanks so much, Tanya!! 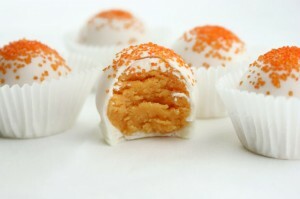 They were fun to make – I like them because they’re not too difficult at all but SUPER cute! HA! I think you may be onto something, Brenda! Those are just way too cute!!! Love it! Haha, thanks so much Jocelyn! 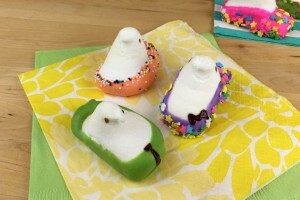 Omg, these are crazy adorable! My little nephews would love these.